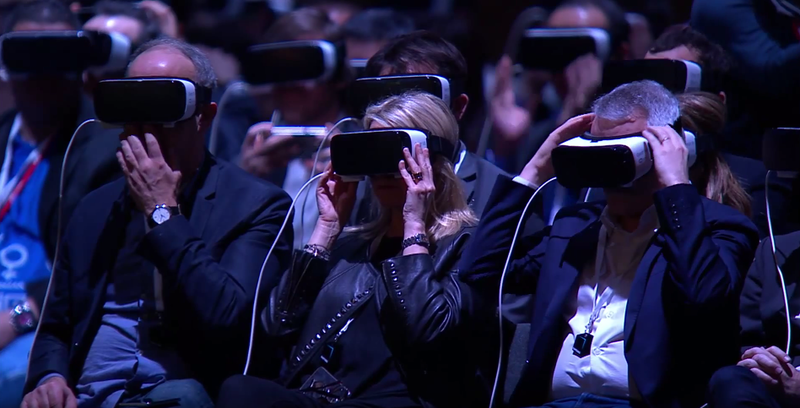 Samsung surprised attendees of its annual 'Unpacked' event at Mobile World Congress this year by wheeling out Mark Zuckerberg to endorse its efforts in virtual reality. In a neat twist on the usual techie press conference, Samsung laid out hundreds of Gear VR virtual reality headsets on seats, so that the audience could see the company's new gadgets up close as they were announced. Towards the end of the event, the audience was invited to put on their Gear VR headsets and watch a short film shot on Samsung's new Gear 360 camera. Once they took their headsets off, Facebook's founder was standing on-stage. In his speech, Zuckerberg recalled writing code in his notebook at school and envisaging the ability to "really" be somewhere else, in a "whole new reality". He went on to talk up Samsung's partnership with Facebook's own VR headset maker, Oculus. He said: "It wouldn't be possible to deliver this experience at this scale and this price without Samsung's experience in hardware and systems, and without Facebook's software and Oculus technology. "VR is the next platform," he added. "It's still mostly used for games and entertainment but that's quickly evolving. One day, you'll put on a headset and that will change the way you live, work and communicate." Addressing concerns about virtual reality's seemingly anti-social nature, Zuckerberg said virtual reality would enable users to watch films in a "private theatre" with friends, hold meetings and gather round the virtual campfire from anywhere in the world. Why is Samsung focusing on VR? Though Samsung's 'Unpacked' events tend to revolve around its new Galaxy smartphones, the Galaxy S7 and Galaxy S7 Edge in this instance, the devices have lost their 'wow' factor somewhat. That's partly down to Samsung's tendency to 'tweak' its phones rather than take innovative steps forward, and partly because most of the details around both phones have already leaked. Forrester analyst Thomas Husson told Marketing: "Samsung's show will be a lot about VR - this will be the wow effect and the buzzword, because I don't expect a lot of innovation from the Samsung S7 smartphones per se. He added that while rivals Alcatel and LG were also making noises around VR at Mobile World Congress, Samsung's marketing budget would allow it to dominate the conversation. He said: "I expect [Samsung] to focus quite a bit their marketing on this topic. They will need to help with the creation of content among developers particularly in gaming/entertainment and will probably be much more present at some big shows like [gaming conference] E3." One potentially off-putting factor for consumer adoption is the expense of forking out for a full Oculus Rift headset. Husson said: "Virtual reality will start opening up experimental opportunities for brands but honestly it will take a long time to reach critical mass. Innovative marketers at retail, automotive, travel, or hospitality companies will start working on prototypes with their agencies. "However, the reality is that it will deliver very limited consumer benefits to the masses. Mostly for a niche of gamers willing to try immersive experiences." 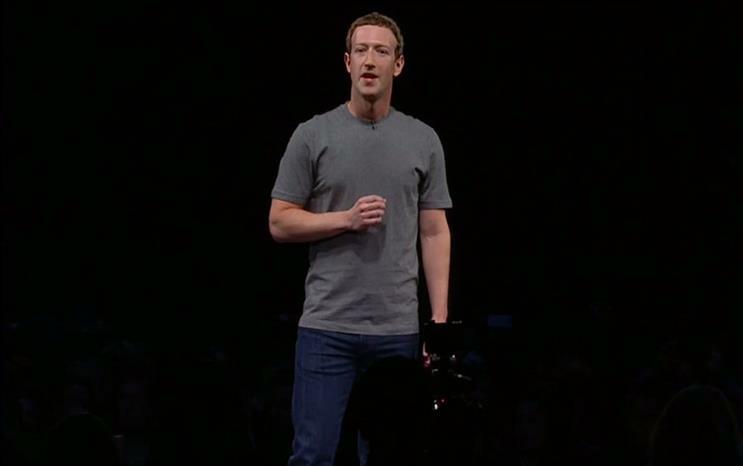 Zuckerberg emphasised Samsung's importance as a partner to beat this problem, delivering virtual reality on mobile, at scale. "Samsung is the leader in shipping hardware like the Gear VR affordably and quickly," he said, adding that the $99 price tag meant virtual reality could soon reach the masses. Indeed, Samsung will give away the Gear VR free to anyone who buys the new Samsung Galaxy S7 or S7 Edge smartphones, also announced during the event. Though it didn't announce an update to the Gear VR headset itself, Samsung did unveil the Gear 360 camera, which shoots 360-degree video. The launch marks a number of virtual reality-friendly cameras launched at Mobile World Congress this weekend, including LG's 360 Cam. Samsung's eyeball-like camera is equipped with two fisheye-lenses, featuring 15-megapixel sensors, giving users the ability to shoot almost 4K resolution video. The idea is to make shooting 360-video (and, by extentions, creating VR content) a little easier. Samsung hasn't revealed pricing details.